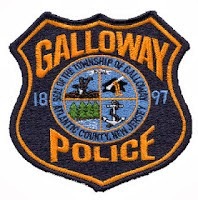 Galloway Township Police responded to 871 calls for service during August 17, 2014 through August 23, 2014. Additional statistics include: 6 Burglaries, 17 Motor Vehicle Accidents, 68 Tickets issued, 1 Driving While Intoxicated, 36 Arrests, 12 Domestic Violence, 17 Fire Calls, 80 EMS Calls and 2 Juvenile calls. Shawn J. Richardson, 24, of Erial NJ was arrested by Ofc. Gary Brenner for contempt on August 17. Sampson E. Jenkins, 20, of Galloway was arrested by Ofc. Dan Weigle for burglary on August 18. Edress F. Myers, 31, of Atlantic City was arrested by Ofc. Dominic Fabrizo for hindering apprehension on August 19. Christopher R. Howard, 21, of Galloway was arrested by Ofc. Scott Winneberger for obstructing the law on August 20. Malik Smith, 22 of Pleasantville was arrested by Ofc .Fenil Ghandi for possession of CDS on August 20. Claudio L. Valentin, 32, of Egg Harbor Township was arrested by Ofc. Scott Winneberger for possession of CDS, possession of less than 50 grams of marijuana, and drug paraphernalia on August 21. Leroy J. Jones, 19, of Egg Harbor Township was arrested by Ofc. Gary Brenner for possession of less than 50 grams of marijuana on August 21. Rhoda C. Meighan, 22, of Egg Harbor Township was arrested by Det. Jason Kiamos for receiving stolen property on August 22. Stephen John McLeer, Jr., 33, of Folsom PA was arrested by Ofc. Carolyn Buckley for burglary and criminal mischief on August 23. A male, 15, of Galloway was charged by Ofc.James Mullholland for burglary, theft, and violation of curfew on August 18. Two females and one male, all 17, of Galloway were charged by Ofc. Scott Winneberger for possession of CDS and one female was charged with possession of drug paraphernalia on August 23.